Caress Body Wash Evenly Gorgeous Burnt Brown Sugar and Karite Butter. This ultra-yummy smelling body wash with Karite Butter to soften the skin also has brown sugar to exfoliate away dried skin cells to even out the skintone. It is not as abrasive as other exfoliators, I would say it is quite gentle. The scent is a delicious brown sugar mixed with vanilla that lingers on a few hours after use. I'm addicted to this stuff! I picked it up whilst in the USA at a local Walmart. You can purchase it as a pack of three here. L'Oreal Elvive Extraordinary Oils Nourishing Shampoo. Here's the newest L'oreal shampoo targeted towards treating fine, dry to rough hair. It moisturises hair without weighing it down or making hair feel greasy. It is not particularly volumising. This shampoo is perfect for the winter season for those who want soft free-flowing hair. Just a note of caution - the texture is a lot more runny than the usual drugstore shampoos so I would be careful of how much you use each time so it does not run out quicker than it should! L'Oreal Elvive Extraordinary Oils Nourishing Conditioner. This conditioner is wonderful for dry damaged hair that has been processed with numerous chemicals, hair dyes and for hair often subjected to heat eg. from regular blow drying and styling. This leaves my hair soft and shiny after every wash. A perfect accompaniment to the shampoo previously mentioned! Femfresh Intimate Hygiene Daily Intimate Wash. I would avoid using normal soaps in the feminine area as skin is sensitive and has a protective yet precise pH which can easily be irritated by ordinary bath gels and soaps. Femfresh has a whole line dedicated to this purpose. This peach one I have has soothing and calming extracts of camomile and aloe vera to keep you fresh all day long. If you live with other people and want to keep this hush in the bathroom, just peel of the labels and no one will suspect a thing! There you have it. Four of my favourite shower and bath time buddies of late. Do you colour match your shower products? And when these run out, I wonder what colour scheme I'll jump to next... If you've got a question or an opinion on this, leave a comment at the bottom of this post! 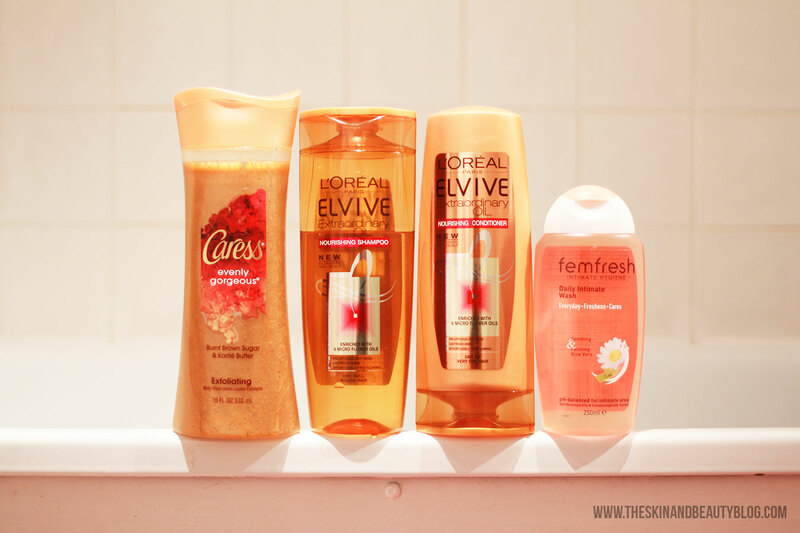 I love L'Oreal conditioners. They make my hair so soft and manageable. I haven't tried this one yet, but I will soon. Sounds great too. Thanks Gio. I'm a big fan of L'oreal hair care as well!